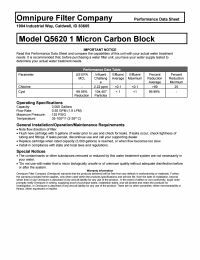 The Omnipure Q5620 1 µm Carbon Block Water Filter is a 1 micron carbon block filter with a flow rate of 0.5 gallons per minute. The Q5620 reduces cysts, lead, scale, chlorine, taste and odor. Q5320 2.5" x 6" 1500 gal. Q5420 2.5" x 8" 2000 gal. Q5520 2.5" x 10" 2500 gal. Q5620 2.5" x 12" 3000 gal. Q5720 2.5" x 14" 3500 gal.